Torbjørn Sandvik, of Norwegian folk metal band Glittertind, wrote in the liner notes of their album Landkjenning: "folk music, and its contemporary expressions through musicians like ourselves, is first and foremost life-affirming, inspirited and uniting..." That is a quote to which I keep returning when I listen to Slavs Part 1, a terrific compilation CD of various Slavic folk bands and ensembles. 20 great songs are packed into a 76-minute runtime, and within those 20 songs are many different styles and from many different countries. Admittedly, I am not as well-versed in Slavic folk music as I wish I were, so this CD has served as a wonderful introduction to the rich variety of music that exists in the area covered by this compilation, though obviously it only scratches the surface of what one might find there. There are 13 different bands and ensembles represented here, and attempting to review this CD thoroughly would require looking at each of these artists individually. I'll do my best. The CD begins with a rather modern-sounding piece by Afion, a five-piece Croatian band who seems to be influenced by folk rock (as they are one of the few bands on the CD that uses a modern drum kit). Then things take a turn with the more traditional-sounding Runo (of Serbia), which uses what strikes me as a more "folk-style" singing and traditional string, wind, and percussion instruments. Next, Slovak children's folklore group Kornička performs a lovely medley of Christmas carols. The next two songs are by another Slovak group, Muzička, and the interesting thing about these two songs is that they don't sound like they came from the same group, as the first piece is entirely a capella, with female vocals, while the second song has a male vocalist and a full string section (in fact, it appears that the only instruments used by Muzička are violins, violas, and bass). I really enjoyed the voice of the male vocalist on this second song, "Pomali ovecki." Not knowing the Slovak language, I don't know what the vocalist is singing, but the beginning of the piece sounds rather thoughtful or somber, but after about three-and-a-half minutes the pace quickens, additional male voices are added, and the mood seems to change to something more celebratory. This is probably my favorite piece of music on the CD, though it's closely matched by the first piece of the next group, a Macedonian band called Monistra. The female vocalist on "Filizo mome," Gabriela Janusevska, has a voice that is absolutely enchanting. She has terrific range and control, and what struck me as a strong Middle Eastern sound in her voice. That strong Middle Eastern sound (for lack of a better description on my part) can be heard in all the contributions by the Macedonian bands on this compilation. The second song by Monistra is entirely instrumental, and there's some nice hand percussion and a very well-played stringed instrument that I can't identify. This second piece is nothing short of exhilarating. Tracks 8 and 9 are two short pieces by Trio Tzane, which is made up of three female vocalists, one from Bulgaria, one from Greece, and one from Turkey. Their only instrumental accompaniment appears to be a sort of tambourine, but they have very unique and interesting voices. The next group, the only one with which I was familiar before I received this compilation, is the wonderful Vedan Kolod of Russia. Their contribution, "U nas nyne," was also featured on the first Scythian Horn compilation, Ritual, but it's such a good piece of music that I didn't mind hearing it again on this CD. 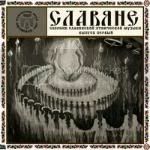 Vedan Kolod is one of the groups on this compilation that don't seem to be at all influenced by modern forms of music. They use all ancient instruments, and one can certainly imagine their style of music existing in the same form hundreds of years ago or even older, somehow captured on modern recording equipment. The blending of the female vocals on this track is beautiful. Russia is also represented by Skomoroshia sloboda, which is a young folklore ensemble from the city of Sergiev Posad. This is another a capella piece, which seems to be comprised entirely of female vocals, singing in a style that I have encountered often in my very limited exposure to traditional Russian music. Tracks 12 and 13 are by Collegium Fiddle Dolce, from the Czech Republic, and I must say that I love these two songs. I don't know if Collegium Fiddle Dolce has any full-length CD's of their own, but if so, I would like to find one. There's a very "happy" vibe to these two tracks that always brings a smile to my face. Some may describe their style as "quaint," and it may not appeal to all listeners, but I come back to their tracks often. Tracks 14 and 15 are instrumental pieces (for the most part) by Makedonka, another Macedonian ensemble. Like Monistra, Makedonka gives my mind a strong Middle Eastern imagery when I listen to them. According to Scythian Horn's website, Makedonka consists of more than 250 members across their various groups (which include folk dance groups, folk singers, and orchestra). It's a shame that these types of groups don't make it over to the North America more often, because I would love to hear this type of music in a live setting. The next band featured, Svjata Vatra, is quite unique to my ears. They are an Estonian-Ukrainian folk band that sounds like nothing else I've ever heard. Their first track on the CD, "Kalyna," has some great accordion and Estonian bagpipes, while the second song, "Verhovyna," has what sounds to me like a... trumpet or trombone? Playing a Ukrainian folk melody? Svjata Vatra is what I can only describe as "quirky," but I would imagine that they would be very fun to see in concert. Svjata Vatra is followed by Slovak mixed-voice choir Tirnavia, performing what, to my ears, sounds like a Christmas carol, and things get interesting towards the middle of the track when the singing turns to chanting, handclaps, and the stomping of feet, before returning to singing and then, finally, back to clapping and the stomping of feet. Next is Tundri, a World Music Orchestra from Serbia. This mostly-instrumental piece (though a choir of voices singing what appears to be wordless vocals appears throughout) has a strong jazz and rock influence and mostly modern instruments. The CD reaches its end with a second piece from Afion, the Croatian band that also contributed the first song of the compilation. This last song, "Dizala skuto," is quite lovely, with hand percussion, handclaps, well-played stringed instruments, and beautifully harmonized male and female vocals, and it brings more smiles to my face to close out a great musical journey. This final song is so good that my first impulse once I reach the end of the CD is to start again with track 1. Slavs Part 1 is a wonderful CD that exposed me to a lot of great music from countries with which I'm not very familiar, and it caused me to want to learn and hear more of what these nations have to offer musically, which is probably the intention behind the compiling of this CD. I'm looking forward to the release of Slavs Part 2, hopefully this year, but, in the meantime, Part 1 is a CD I will listen to again and again. It is one I would definitely recommend for those who, like me, are new to Slavic folk music in its various forms and would like to hear from many talented artists and ensembles whose recordings are very difficult to find. Because this review blog is mainly about pagan and folk metal, I would like to add that many fans of Slavic folk metal who are interested in exploring beyond metal will find much to enjoy in this compilation, as I have.